As a new teacher, I am struggling to make something I find so obviously important (ahem, theology) matter to my students. The spring of 2016—my first semester teaching—I realized quickly it would be an uphill battle to make the concerns in Augustine’s Confessions relatable to my students. Sophomores at my university are required to take my class (a great books seminar focused on the Catholic intellectual tradition), and although many were raised in a Catholic or Christian tradition, the abstract, ancient and seemingly impractical questions about God and religion addressed in my course did not readily compel or even interest them. When the semester ended, I did not feel my class had the impact I had wanted (to my surprise, no one dropped their finance major to take up theology!). I tried Augustine once again this past fall. Once again, it was an uphill battle—but we were starting to get somewhere. Catholic Universities must teach faith across disciplines. We spent one class on the chapter in which Augustine frets over the immateriality of God. Immateriality, conceptually, is difficult for Augustine: How can he perceive of God if he cannot picture God, if God does not occupy space? And God certainly cannot occupy space, because that would make God material, and the material world is subject to change, decay and death—things that cannot be true of God (at least, not any God in whom Augustine is interested). In this lies an important issue for Augustine: God cannot be contained in the imagination because the imagination relies on spatial assumptions for its images. And God cannot take up space, lest God be too closely related to the material world. Simple, right? I should have seen it coming. They offered an explanation based on their modern sensibility—that is, based on our modern, collective comfort with the possibility of a “spiritual” realm. God is spiritual, and so is Grandma, and so is my yoga practice—easy. We have inherited a watered-down version of the answer (and all of its novel applications) Augustine struggled to find, but we have lost sight of the question that initially prompted his thinking. God is spiritual, and so is Grandma, and so is my yoga practice—easy. Reluctant to let them off the hook without digging a little deeper—after all, Augustine was not a simpleton; there must have been good reason for his intellectual hang-up—I pressed them. “Of, relating to or affecting the human spirit or soul as opposed to material or physical things.” The discussion was stuck on a tautology disguised as a first principle: God is not material or physical because God is spirit—and spirit is non-material and non-physical. They remained steadfast: “God is spirit. I guess I picture Jesus. Or a dove.” Another responded, “I picture the wind.” While trying to affirm the rationale behind these images, I struggled to communicate why they did not satisfy the whole of Augustine’s concern. I wanted them to realize that Augustine’s dilemma was indeed a human dilemma—it might even be their dilemma—and not one that is adequately addressed or summarily dismissed with inherited platitudes and pre-fab conceptions of God or religion. How could I present ancient questions so they have meaningful stakes for modern readers? How could I present ancient questions so they have meaningful stakes for modern readers? How can I make abstract questions of God, religion and faith matter in novel ways for a new generation? How had my parents, my catechists, my professors first made these questions meaningful for me? In a desperate Hail Mary (forgive the pun), I proposed one last question that would not allow them to rely on terms like God, spirit or materiality, a question that might break them loose from reliance on predetermined notions of God. A question that might resonate meaningfully with modern students. After a minute or two of pensive quiet, a few attempts to answer were made: Perhaps a browser page? A login screen? Through conversation we all agreed that phones, tablets or laptops are not in themselves the internet. They are merely spaces where the internet seems to live. So, too, with browser pages and login screens. Cables in the ground are cables in the ground—and though the internet might be related to those cables or browsers or tablet screens—my students collectively concluded that they are not, in fact, The Internet. I pressed them: “But we all talk about the internet. We all know what we’re referring to when we say ‘internet,’ and where to find it and what role it plays in our lives. Why can’t you picture it?” I will admit: I was already a little giddy at this point. We meet God in churches or nature; we meet the internet on laptops or wifi hot spots. Every observation the students made—observations about predictable points of access, about familiarity and personalization, about universality and community, about its ever-present-yet-invisible nature—provided a working metaphor for the way we may experience or understand God in modern life. We meet God in churches or nature; we meet the internet on laptops or wifi hot spots. Our homepage and bookmarks are personalized, and so is our specific mode of prayer. And despite this familiarity and personalization, we find there are corners of both the internet and our own religion that seem entirely foreign. We may not see the internet—or the divine—but we trust both will be there for us when we show up with a need. Power outages and inexplicable suffering are often the occasions that prompt our sudden and keen awareness of our utter reliance on these metaphysical (or at least metasensory) realities. The experience of wrestling to define or imagine the internet mirrored and illuminated the nature of Augustine’s struggle hundreds of years before. If the internet—which is man-made and finite—resists the ability to be easily imagined or outlined, how much truer must that be of God? I have found that it is unproductive to force theological ideas into the minds of students despite their disinterest. I have found that it is unproductive to force theological ideas—like Augustine’s understanding of evil, Dante’s depiction of the beatific vision or Flannery O’Connor’s morbid but hopeful anthropology—into the minds of students despite their disinterest. Instead, I try to translate the import of these weighty concerns, claims and questions so students can feel what Augustine or Dante felt when facing these existential summits, or so they can entertain Plato’s suggestion that perception and reality are not necessarily what they seem. Theology is impotent and irrelevant when simply presented as a set of ideas, doctrines or conclusions to be passively internalized. Instead, it is the kind of discipline that requires first making the questions that drive theological inquiry meaningful, long before answers can even be introduced. Thank you Ellen. Spot on. I too teach theology to undergraduates, a majority of whom are not divinity majors (I teach at an Eastern Orthodox institution). I find that beyond the point you make building a relationship of trust and genuine caring for their place in life helps open the path to teachable moments. We are not uploading data into brains. I want them to start asking the difficult questions and rethink facile assumptions. But this is always with their permission, gently and not forced. I can consider some level of success as a teacher only when my dear students engage with the subject matter - regardless of the answers they may reach. 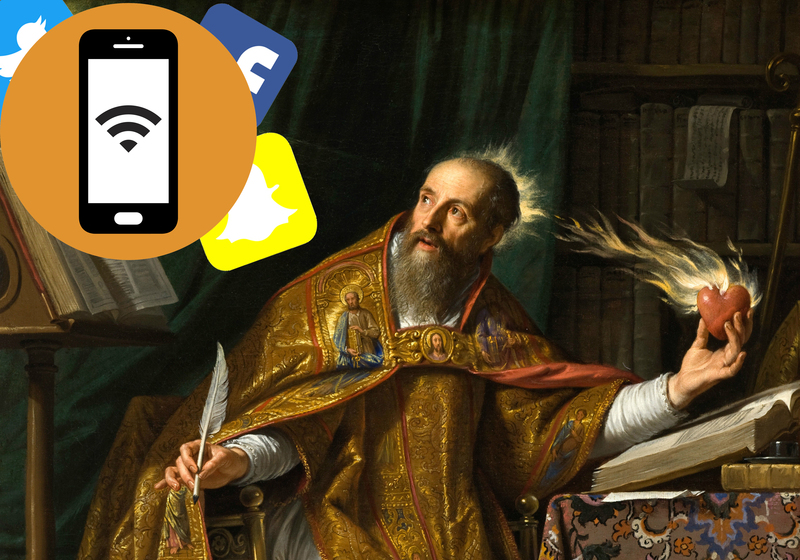 This article also appeared in print, under the headline "Augustine in the Internet Age," in the February 5, 2018 issue. Ellen B. Koneck is the community and events manager at Commonweal and taught in the Catholic Studies department at Sacred Heart University in Fairfield, Conn.